Organizations evaluating options for email backup and disaster recovery need to be aware of several key factors that could affect the effectiveness of the option and its compliance with industry regulations. Once these primary issues have been resolved, other factors – such as deployment and ease of data retrieval – should also be considered to ensure the implementation of the most appropriate option. In order to be fully effective and achieve absolute compliance with industry regulations, an email backup has to copy every email that enters or leaves a mail server. For this reason it is essential to only evaluate options that backup emails in real time, rather than those that perform periodic backups. Periodic backups allow for emails to be altered or deleted without a copy being made of the original, and therefore fail to comply with regulations relating to the retention of data. Real time backups give organizations an immutable copy of every email in the state it was at the time of entering or leaving the mail server. This is essential if an organization has to restore data to the mail server after a natural or environmental disaster, or in the event of a cyberattack removing data from the mail server. Although the data may be encrypted, and therefore of no value to a hacker, it will be difficult for an organization to function effectively without access to recent email correspondence. There is a choice of four deployment options for email backup and disaster recovery solutions – hardware, software, cloud-based and hybrid. Hardware options are the least secure, as hardware and removable media onto which data is copied can be damaged, lost or stolen. The risks to the security of email data make hardware deployment an unsuitable option. Software email backup and disaster recovery deployment options also have security risks associated with them – and by association this encompasses hybrid options. Email data stored on software can be corrupted or stolen by cybercriminals and, without a backup of the backup, an organization may not be able to recover its lost data in a disaster scenario. Both hardware and software deployment options are subject to storage limitations. Once the limits are reached, organizations have to purchase more hardware or more server space. This is not an issue with cloud-based solutions for email backup and disaster recovery, as the amount of storage space grows dynamically as the volume of retained email data increases. Recovering a lost, misfiled or accidently deleted email can be a time-consuming process, not only for the user trying to recover the email, but also for IT support – whose services will undoubtedly be requested when the user has tried every other way they know of recovering the email. Cloud-based solutions overcome this problem by backing up and archiving emails into one large easy-to-search database. The single database solution can have advantages for larger organizations that send and receive email across multiple servers or use a selection of email accounts. Only one search is required to retrieve emails sent or received over multiple servers/accounts – a feature that accelerates e-discovery when sensitive information is required to support litigation or to resolve HR or client issues. However, the ease of retrieval should be limited to authorized personnel only. It should be possible for users to recover their own emails and emails sent to them. Access to business-critical information and intellectual property should be limited to system administrators. For this reason, a solution for email backup and disaster recovery should also have a mechanism for delegating appropriate access. ArcTitan Cloud is a fully effective and compliant solution for email backup and disaster recovery from WebTitan. Being a cloud-based option that backs up emails in real time, organizations always have an immutable copy of emails and their attachments to search and retrieve when necessary or to restore in the event of a disaster. ArcTitan Cloud is a reliable, versatile and secure solution for email backup and disaster recovery. All email data is maintained in encrypted format in an IL5 certified data center and data transferred between the mail server and data center via mandatory TLS protocols. If a disaster scenario occurs, the backed up copy of the data can be accessed via a browser-based platform by authorized personnel. Searches are quicker and easier with ArcTitan Cloud. Our archiving process removes all duplicated content from emails before indexing the content, compressing the data and archiving it. This process accelerates the speed at which searches are conducted and eliminates duplicated data appearing in search results – making the results easier to navigate. ArcTitan Cloud also provides tamper-evident audit trails. These are particularly important for organizations in regulated industries as they identify any unauthorized alteration of an archived email. The audit reports can also be used to identify unusual client-specific activity and can help an organization with its audit-compliance requirements. If your organization is evaluating the options for email backup and disaster recovery, we invite you to try ArcTitan Cloud free for thirty days. ArcTitan Cloud is quick and easy to deploy, and does not use proprietary file formats, so there are no set up costs or data conversion costs. Existing archived data can be imported in a variety of formats and indexed by our email backup and disaster recovery solution for almost instant accessibility. To find out more about our offer, or to discuss any points raised in the article above, do not hesitate to contact our team of Sales Technicians. Our team will be happy to answer any questions you have about email backup and disaster recovery and guide you through the process of registering for your free trial – liaising with your IT department if necessary to ensure a seamless deployment of ArcTitan Cloud. 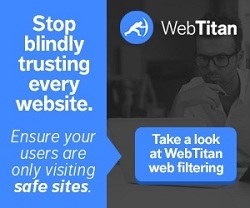 In addition to email archiving, if you want to keep your inboxes free from spam and malware, be sure to ask about SpamTitan – the best spam filter for business use.